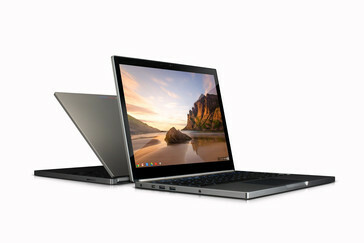 Google has officially announced their Chromebook Pixel, a 12.85" notebook running a brand new touch-enabled version of Chrome OS. It's already available for pre-order, while shipments will begin next week. Google has announced their Chromebook Pixel, which is essentially a notebook running Chrome OS with the added perk of a touch-enabled screen. The announcement on Google’s official Blog almost immediately starts off by apologizing to their partners. 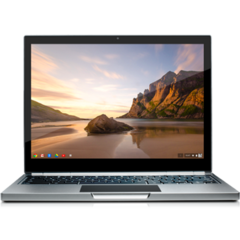 However the Pixel has a few unique features that should avoid direct competition with Chromebooks from Samsung, Acer, Lenovo and HP. By far the most interesting feature of the Chromebook Pixel is the screen. For starters it's a touchscreen, meaning Chrome OS was upgraded to handle touch and better compete with Windows 8. However the truly unique feature is the display’s 3:2 aspect ratio. That’s the aspect ratio of - near extinct - 35mm film and therefore most old printed photos. The screen measures 12.85 inches diagonally with a resolution of 2560 x 1700 pixels. That results in a pixel density of 239 PPI and adds up to a total of 4.3 million pixels. Google claim the Pixel’s display to have “the highest pixel density of any laptop”. 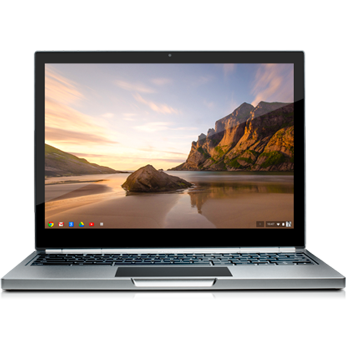 To the dismay of most reviewers and commenters around the web, the Pixel has a starting price of $1,299.00 for only 32 GB of storage space. 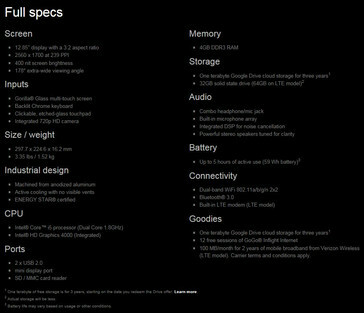 There will also be an LTE version (available on Verizon) with a 64 GB SSD made available for $1,449.00. However both come with 1TB of free Google Drive storage space for three years. But what Google failed to mention, and most people failed to pick up on, is that the company is currently charging $49.99 / Month for 1 TB of storage. That would make three years add up to a grand total of almost $1,800. Both notebooks come with a dual core 1.8 GHz Core i5 (exact model not specified) and 4 GB DDR3 RAM. Not so great are the "up to" 5hrs battery life and no USB 3.0 (2 x USB 2.0). The Wi-Fi version will start shipping next week in the U.S. and U.K. for $1,299 and £1,049 respectively. The LTE version will be available in April for $1,449 (U.S. only, for the time being). For a hands-on experience, you can visit select Best Buy (U.S.) and Currys PC World (U.K.) store locations.